Luxurious Lowcountry oceanfront home features high end appointments, exceptional amenities & gorgeous furnishings. 6 bedroom suites plus a private office with queen bed. Multi-level home features elevator & exquisite details throughout including direct access to covered oceanfront patio w/grill station. Expansive gourmet kitchen, top of the line appliances & 2 ovens. Large private pool w/heated spa & underwater sundeck. Fully furnished w/flat screen TV's in living room, den & all bedrooms. 3 car garage and incredible landscaping. Fabulous permanent home, second home or vacation property with over $300,000 of rentals already booked for 2019! 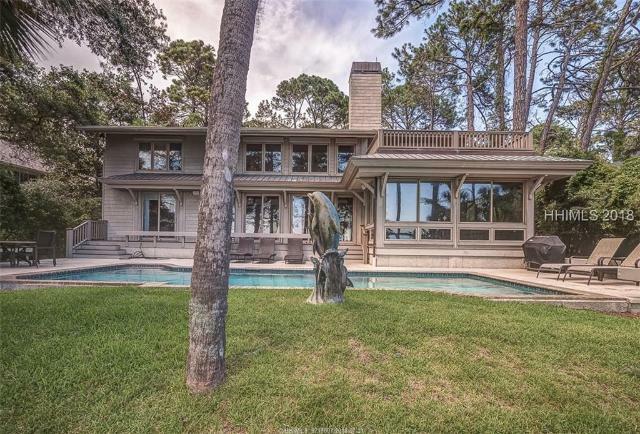 Exclusive beach escape located on the pristine oceanfront in Sea Pines Plantation. Luxury & comfort at its best! No detail has been overlooked in this custom home w its reclaimed antique hardwoods, vaulted ceilings & balconies overlooking the Atlantic Ocean. From the chef's spacious kitchen to the dramatic fireplace in the Great Rm, this oceanfront dreamhouse is calling you! 4 Master suites, media/5th BR, wine storage & elevator access, together w/outside living & entertaining poolside, makes this is the get-away that you & your guests will yearn for yr round along w all that Sea Pines & HHI have to offer! Schedule your private showing today. Magnificent Oceanfront Home GÇô meticulously maintained since being renovated in 2007. Grand foyer entrance with 3 levels of living space and high quality features throughout. Panoramic ocean views from the kitchen, family room, and living room. 2nd family room downstairs with a bar, dining area, and screened porch. Just off the downstairs family room is the private, heated pool/spa, and beachwalk. Hardwood flooring & doors, marble & mexican tile flooring. Master Suite has a fireplace & his and her baths. Paved driveway, 3-car garage, 2 laundry rooms and an elevator. Tucked back beyond the dunes, this is a private beach front dream. Upon entry through the etched double front doors, you are greeted with a hand painted mural that leads you to the living room with expansive views out to the ocean. This newly furnished 7 bedroom, 8 bathroom home is great for entertaining with a large kitchen and dining area, several living areas and a second floor wet bar adjacent to the balcony overlooking the pool and ocean. There are 2 ocean front master suites and 5 additional guest bedrooms with private bathrooms. The pool deck leads you to your private boardwalk out to the beach. Located close to South Beach Marina. Cape Cod-style, Cambridge-built home exudes casual elegance. Large living areas upstairs & down ensures plenty of space & enjoyment for family & friends. Downstairs living features Savannah brick fireplace, coffered ceilings. Walk out to covered patio, heated pool, large back yard to private beach walkway. Upstairs living area with cathedral ceilings, exposed beams, gas fireplace, huge screened porch to enjoy ocean views & breezes. New kitchen appliances, new granite counter tops. 4 Brs, 6 Ba's, never rented, only two owners over the years. Major upgrades, meticulously maintained = great value for this beautiful, well-built oceanfront home. The beckoning views of the Atlantic Ocean provide the backdrop for this remarkable home. Water views from nearly every room make this the epitome of beach living on Hilton Head Island. Rarely does a home on Canvasback Road come on the market. This home features 5 bedrooms, 4 full baths and two half baths and has never been on the rental market. Wake up each morning to the sounds of the dolphins playing in the waves and feel the cool breezes of the Atlantic Ocean. Spacious rooms, open floor plan, elevator, and so much more. Close to the Ocean Gate for easy in and out of the plantation. This home must be seen to be appreciated. The design of this 4 bedroom 4.5 baths home was developed with such meticulous attention, and it is best evidenced by the open comfortable floor plan perfect for both entertaining and family living. Situated on an over half-acre lot, this property offers views out to the tidal lagoon, marsh, and Calibogue Sound to include your personal landing with pull bridge to your own private island. This home features 4910 sq ft all on one level with beautiful modern open Kitchen, multiple dining and lounging areas, Master Suite, and park-like grounds including pool and 2 car garage. Enjoy a lifestyle of luxury combined with comfort. A Forever Home! Beach front living in the heart of Sea Pines located adjacent to the Sea Pines Beach Club! This furnished 7 bedroom, 7 bathroom home offers spectacular ocean views from all levels with floor to ceiling windows and a glass enclosed widowGÇÖs walk. There are 2 master suites and 5 additional bedrooms, all with private bathrooms, throughout the 3 levels, accessible by elevator. The main living areas and both master suites have panoramic views over the large pool deck out to the Atlantic Ocean. The pool deck is large enough for separate sitting, lounge and grilling areas. This home offers a well established rental history. Direct oceanfront in private, gated community. Deep walkway lot showcasing 20+ mature palm trees on desirable street. This beach cottage has established rentals with many loyal guests (31 confirmed bookings already in place for 2019 with rental revenue totaling $138,337). Home features 2 large sitting rooms, 2 beautiful brick fireplaces (wood burning), an expansive screened porch and vaulted ceilings in the great room. Home being sold "as-is". Owner is relative of BIC. Stunning views of pool, beach and Atlantic Ocean. Currently a vacation rental home which generated 33 bookings for $190,000 rental revenue in 2018. 28 weeks already booked for 2019 for $166,778 rental revenue. 5 of 6 bedrooms have ocean views. Pool features a tanning ledge (shallow end leveled at 1.5 feet). 6th bedroom is located on the 3rd level and has it's own entrance (no interior access). Being sold "as-is". Listing agent relative of property owner. Want the beach in your backyard? This oceanfront Sea Pines home w/the adjacent oceanfront lot is now available. Just steps to South Beach Marina, Dining & Tennis. Custom built by Johnson-Dulaney this home features 5 bedrooms, 6 baths and a light filled two story living area. Custom built with hardwood floors, brickwork cabinetry and quality craftsmanship of days gone by. Sweeping porches and decks from the living areas, main floor master suite and upstairs bedroom. Covered outdoor summer kitchen, private pool, spa, hurricane shutters, dumb waiter and lots of storage. Take the Private Boardwalk in the backyad to the beach. Welcome to the beach! A charming brick courtyard invites you into this classic oceanfront property off South Beach Lane. Once inside, you'll immediately feel at home among the fun, beachy decor. Two living areas provide enough space to stretch out and each has its own fireplace. With 3 bedrooms on the 1st floor and 2 bedrooms on the 2nd floor, there is plenty of room for everyone. When it's time to eat, a huge eat-in kitchen has seating for 14 people. Or head outside and use the outdoor BBQ and poolside patio on sunny days. The sprawling 2nd floor deck overlooks the pool, ocean, and expansive backyard with its own custom putting green. This is for the individual that wants to build the finest home on one of the largest homesites left in Sea Pines. Huge Oceanfront Lot on Prestigious Beach Lagoon in Sea Pines. (Currently has a home on it) This one of a kind lot has .67 acres and 60 feet of beach frontage. There is room for the estate of your dreams along with plenty of room for oversized amenities such as swimming pool, volleyball court, multi-tiered decks with outdoor kitchen, fireplace, screen porchesGÇª. Let your imagination run free.